As a foodie, I always make sure to keep an open mind and an open palate especially for cuisines I haven't delved much into yet. And just this week, together with my lovely girls from The Foodies Circle, I've gone to explore more of Thai cuisine from a notable food destination. 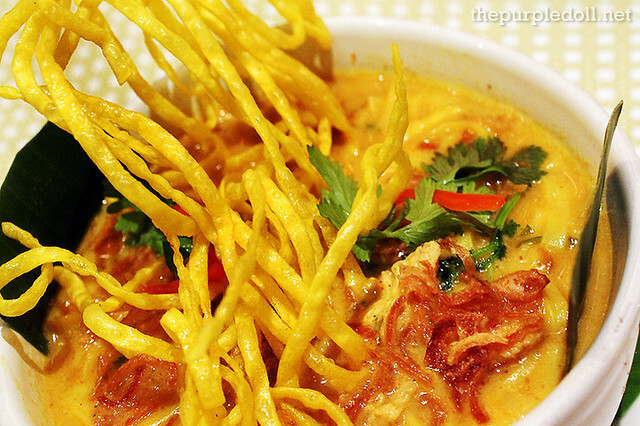 This time, it's a feast of contemporary Thai gustatory treats at Simply Thai. 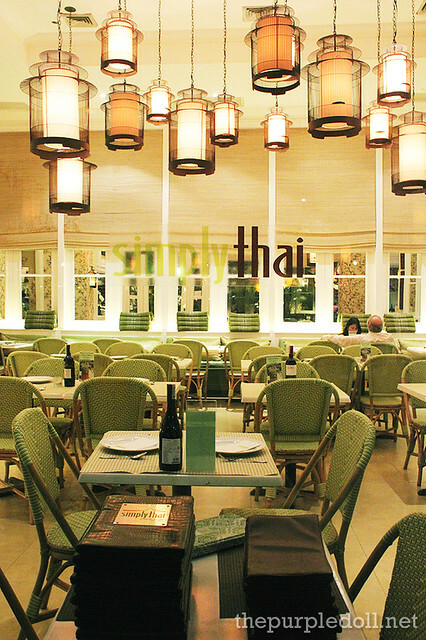 Located at Greenbelt 5's ground floor, the side near Greenbelt 1, stands a sophisticated dining space that is Simply Thai. Since I don't frequent this part of the mall, I didn't have a single idea of how the restaurant would look like. However, I was blown away when we entered the Thai resto's doors. We were welcomed by a beautiful set of golden hanging lamps, a wide dainty mirror, and a charming space drenched in gold, beige and green. My shots can't justify how lovely Simply Thai's restaurant interior is. I just felt at home in an instant with such a relaxing atmosphere. Initially though, I thought the place seemed a little European-inspired. But upon assessing the space, I saw that the walls are adorned with bamboo prints giving off an elegant, warm and contemporary Asian-European feel. If you've been a regular reader, you'd know that I haven't tried a lot of Thai dishes yet. So as expected, I was very excited to see what this charming resto offers. And like other Thai restaurants I've visited, Simply Thai also has a wide selection of food items ranging from soups, appetizers, salads, curries, stir-fried meat & veggies, noodles and desserts. We started off our dinner with a bowl of Tom Yum Kung (P155), a famous Thai hot and sour prawn soup made from lemon grass, galangal, lime juice and leaves, fish sauce and chili peppers, with coconut milk and fragrant herbs. Although I've always known authentic tom yum to be too spicy for my taste, this version is gentler on the palate and has a nice balance of sourness which makes it easier to appreciate even for a first-timer. Next on our table was Yam Som O (P290), a restaurant bestseller which is actually a savory yet still refreshing Thai prawn, chicken and pomelo salad. Although I haven't had a lot of pomelo salads in my life, it's nice to see that at Simply Thai, they don't scrimp on the ingredients. Even the pomelo chunks and cilantro leaves came in generous portions. We then had a serving of Chiangmai Khao Soi Noodle Soup (P320), a hearty rice noodle coconut-curry soup that comes with a choice of chicken, beef or seafood, and is topped with cilantro leaves and crispy noodles and shallots. I may not be too fond of curry, but this hot bowl became an instant favorite. The soup's curry flavor is mild which made it very easy on the palate, while the crispy noodles were so addicting to munch. 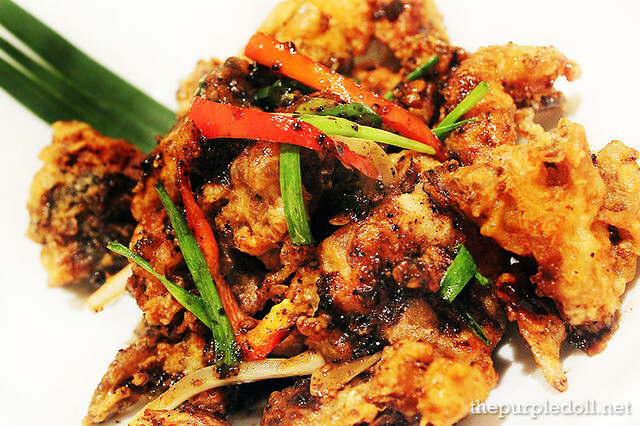 What followed suit was a serving of Black Pepper Soft Shell Crab (P395), a plate of crunchy tempura crabs drenched in a black pepper sauce. This dish is another winner in my books! Every bite is an explosion of savory flavors which makes it a safe choice for those who aren't too acquainted yet with the bold and complex taste of Thai cuisine. 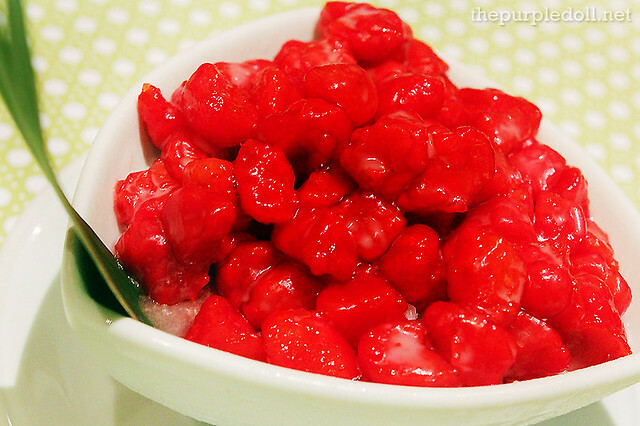 After a flavorful meal, we had Takhoo Sakhoo (P190) for dessert. 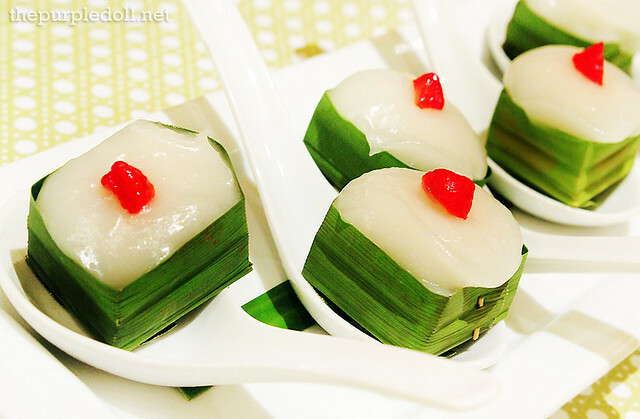 These are steamed cakes with tapioca pearls at the bottom encased in fresh pandan cups. Upon first bite, I was reminded of our local maja blanca (coconut pudding) as these are also sticky and quite sweet. Of course, with the exception of the soft and addicting tapioca pearls. We also had a serving of Thap Thim Kwarp (P185) also known as red rubies which is a dessert of ruby-colored water chestnuts on shaved ice and sweet coconut cream. While this dessert doesn't taste quite sweet generally, the water chestnuts have a mild nutty flavor and an interesting chewy and nutty texture that makes them a delight to munch. 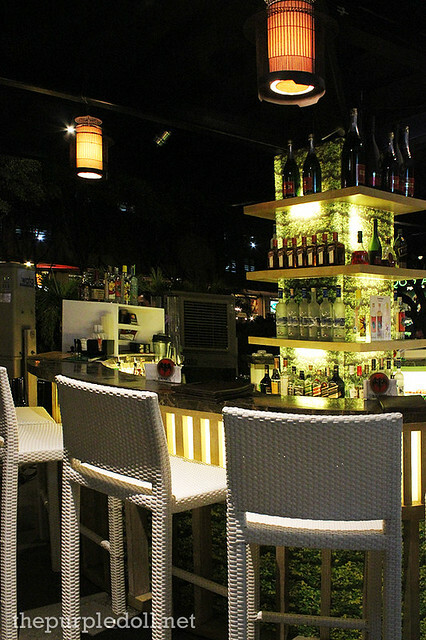 There's a wide selection of drinks at Simply Thai, from fresh juices, teas, smoothies, coffees, cocktails, mocktails, beer and other alcoholic beverages, which you can enjoy either inside the charming restaurant or at their outdoor bar. 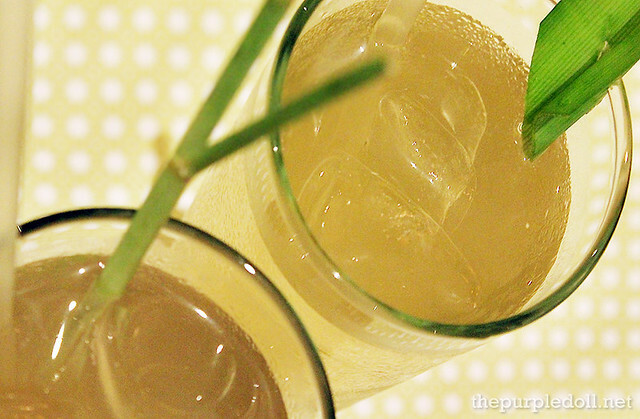 As for us, we had the Pandan Juice (P80) and Lemongrass Juice (P80) as drinks which went perfectly with our flavorful dinner. Both juices are light and very refreshing. However, you must add the accompanying syrup as these are not sweet on their own. 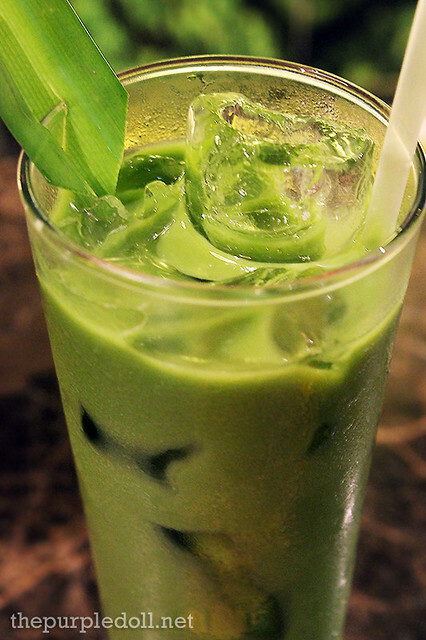 We also headed to the bar where one can order any of Simply Thai's beverages, both alcoholic and non-alcoholic like this glass of Thai Milk Green Tea (P120). I didn't quite like it upon first sip as it had a matcha green tea taste, and a distinct flavor which I can't figure out. 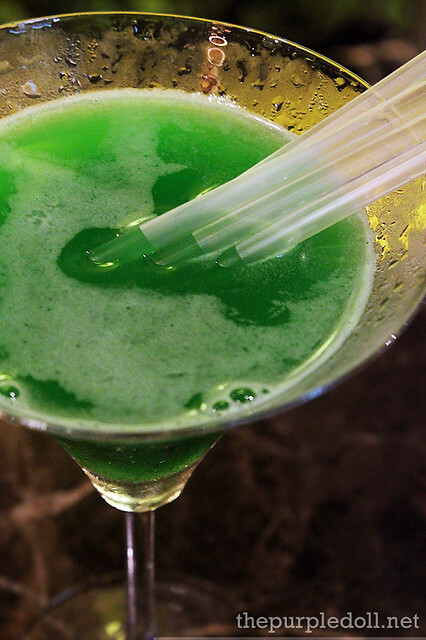 However, after taking a few succeeding sips, I learned to like the concoction. I found it creamy and I guess my taste buds got used to the strong flavor already. 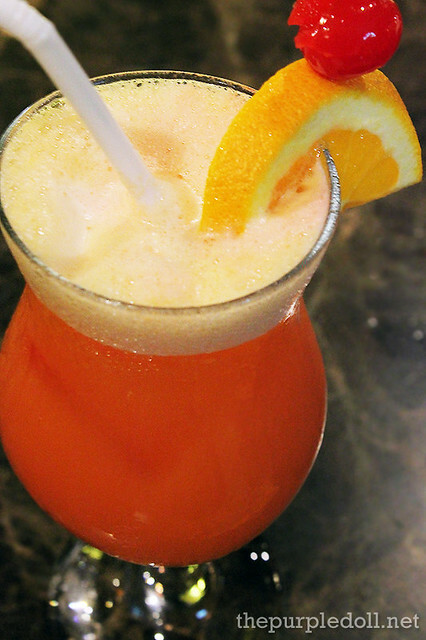 Simply Thai also offers Bottomless Cocktails daily from 4 to 7PM for P299. Definitely a good news for the cocktail lovers out there! And although we're not really in the mood for drinking, we didn't miss trying out Blue Day -- a green blend of orange-vodka and blue curacao, refreshing yet has a strong aftertaste. We also had the Simply Thai Punch -- a fruity and zesty concoction of rum, citrus and apples, perfect even for first-time drinkers. 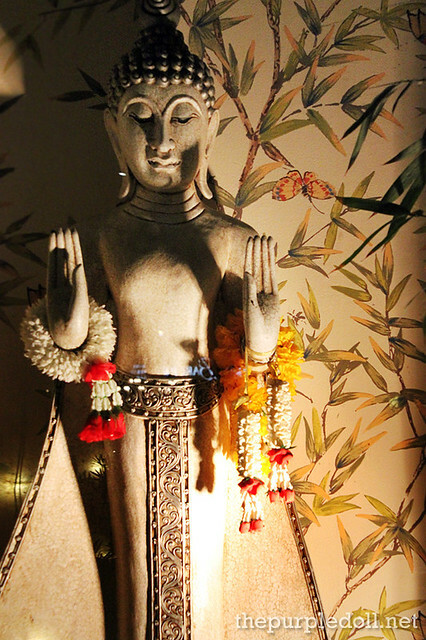 Our visit to Simply Thai had strongly influenced me to develop a fondness for Thai cuisine. Although I haven't tried a lot of authentic Thai dishes yet, I can definitely say that I'm in love with the contemporary take on them. The flavors aren't too bold nor too complex that even newbies to the cuisine will be able to appreciate the dishes. And with reasonable prices and a charming interior added into the mix, I'm all sold. Simply Thai can expect another visit from me soon. Crab lover here but I've never tried any cooked the Thai way. Singaporean crabs are my faves. 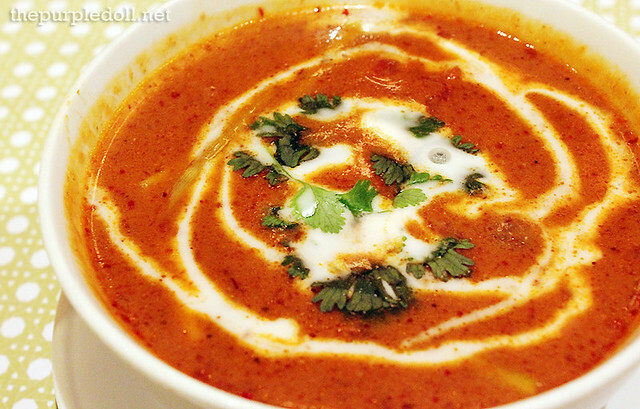 :D We love Thai curries and sour soups though and might just give this resto a visit. The place looks ethereal! (?) Haha! You guys are going to a lot of interesting places! I'm jealous! I haven't tried much Thai food to date, so I'd love to check this out. The Food itself is tantalizing enough! I super love Thai food .One of my favorite international cuisine. I like the chair and its color of the Simply Thai restaurant. Thap Thim Kwarp, I never tasted it before, it looks mouthwatering. i love the food in Simply Thai but the food is a bit pricey.. 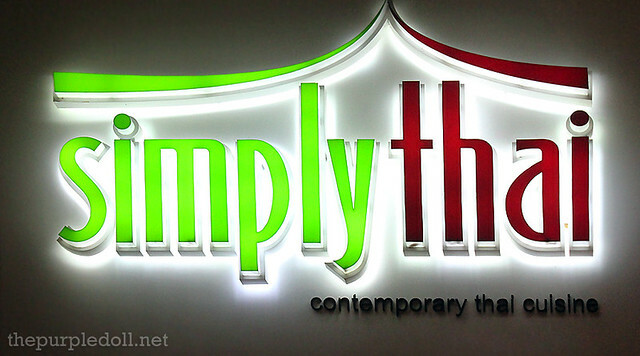 I've tried simply thai several times and I love their curries, especially the spicy ones. If only I have enough money to buy this stuffs, ahhh my stomach will always happy. I simply love your food photos. Nice shots! Wow. Thai foods everywhere! How do these foods taste compare to Filipino native dishes? I'm very curious to taste them! I love the vibe of the place. And the fact that they got my favorite Thai dessert, I'm definitely heading there for lunch when I head over the area this coming week. The prices are reasonable. Must try when I pass by Greenbelt 1. OMG. I'm hungry again. Anyway I love the interior design of the place and the food looks superb. Just had my Thai meal and it was as satisfying as yours Sumi dear :) The Tom Yum you had looks uber delicious with a creamy kick! Even with the smallest peak your pictures provided of the restaurant's interiors, I can just imagine when you say that you were blown away. The ambiance is always an important factor in any dining experience. nice food. all is appetizing and made me drool. Oh my! foodgasm!!! Love the photos. Food has always captured my interest. Thai food are great due to the various herbs used in each dish. Nice Photos. I love that Thai restaurants (I've only been to two *lol*) have different types of food. There's rice, meat, soups, noodles etc., They look like it could be Filipino food, but there's a kick of flavor that's very Thai. I wanna try them. Hope they open more branches esp in the north area hehe! :)) And their prices are not bad. this will surely be on my foodie index since I love Thai cuisine! really nice interiors they got there.